"What have been my experiences thus far in utilizing the Freedom of Information Act? What are the exact timeline and results patterns of my to-date requests?" For almost three years now, every six months or so, I draft and submit a legally binding, constitutionally protected request to the FBI demanding that that agency provide documents associated with an investigation of myself as a person of interest in past or ongoing investigations. This is a common process I follow, whereby any US citizen can invoke a constitutional power known as the Freedom of Information and Privacy Act (FOIPA) and thereby obtain data from any Federal Agency (not just the FBI, btw). 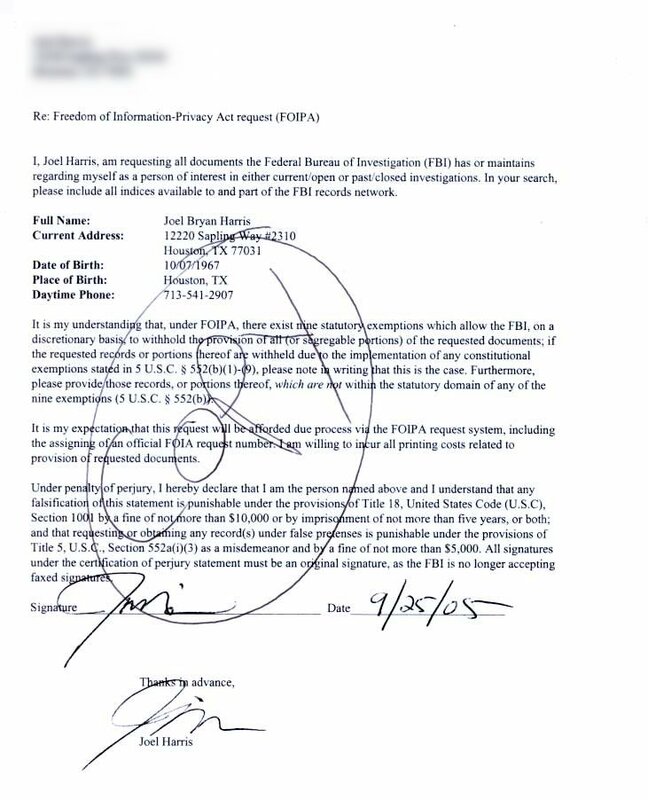 The agency in question must provide the data requested unless the request falls under any of the nine constitutional exemptions afforded federal agencies, in making a decision to withhold data; furthermore, federal agencies are not legally bound to create records that are contained within the FOIPA databases, so other than claiming a specific exemption in defense of withholding data, an agency can simply say, we did not include that set of records in that particular FOIPA records system. In the resources section of this site, I offer pointers to extensive online resources related to understanding and utilization of FOIPA to make your own requests. Following, find a timeline of my requests to-date. Following, find a timeline describing in chronological order, FOIPA correspondences between myself and the FBI; this list includes correspondence with both the local Houston field office and as well, FBI headquarters in Washington. Where possible, I have included scans of the actual documents related to any given correspondence with the FBI. 1/27/2003 - - Plaintiff receives word from William C. Haman that the "Houston office located no records responsive to" plaintiff's request (FOIA #972156); William C. Haman notes specifically the FOIA number and the date ascribed by Plaintiff to the particular FOIA request. 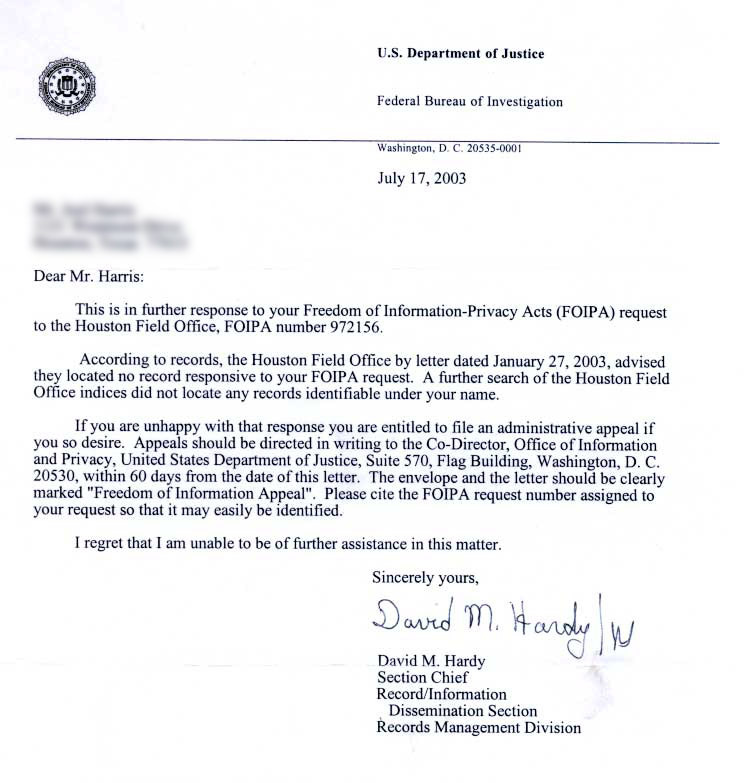 7/17/2003 - - Plaintiff receives further word from David Hardy at Washington FBI headquarters regarding FOIA # 972156; David Hardy reiterates the null findings of the Houston office; David Hardy notes specifically the FOIA number and the date ascribed by Plaintiff to the particular FOIA request. 7/20/2003 (approx) - Plaintiff files administrative appeal to Department of Justice contesting null results of FOIA #972156. 8/5/2003 - - Plaintiff receives word from Priscilla Jones at DOJ that administrative appeal was received and assigned number 03-3011. 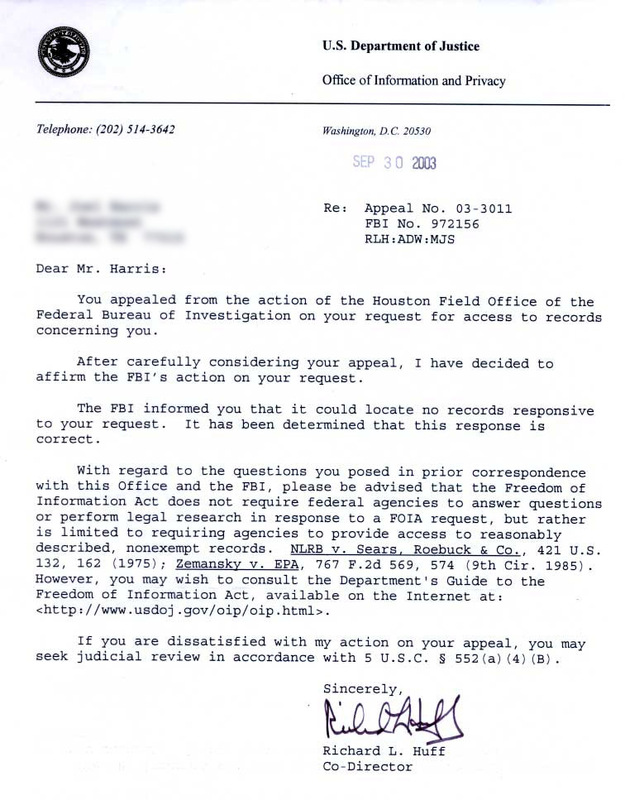 9/12/2003 - - Plaintiff hand delivers second FOIA request to Liz Norwood at Houston FBI field office; plaintiff is informed that Houston Field office of FBI is no longer directly processing FOIA requests and that all subsequent requests must be forwarded to Washington FBI headquarters. Liz Norwood informs plaintiff that this FOIA request will be faxed to Washington for processing. 9/15/2003 - - Plaintiff re-writes FOIA from 9/12/03, correcting minor error in original 9/12/2003 document and faxes directly to Washington headquarters including handwritten note ascribed to faxed FOIA stating, "please disregard any FOIA requests received prior to or post this request;" the handwritten note was included as an attempt to prevent the 9/12/2003 document being processed in lieu of the 9/15/2003 document. 9/16/2003 - - Plaintiff receives letter from William C. Haman at Houston field office that FOIA dated 9/12/2003 is being forwarded to Washington headquarters for "direct response." 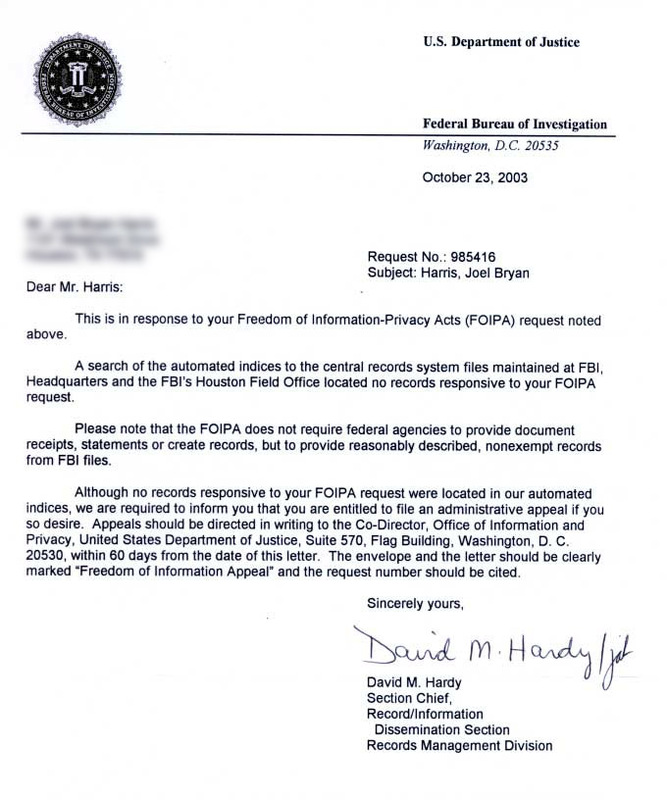 10/21/2003 - - Plaintiff receives word from David Hardy at Washington FBI headquarters that a FOIA request was received by his office and given #0985416-000; David Hardy, unlike past correspondences, fails to note on what date his offices received this particular FOIA request, nor does he cite the date ascribed to this particular FOIA request by the Plaintiff when authored. 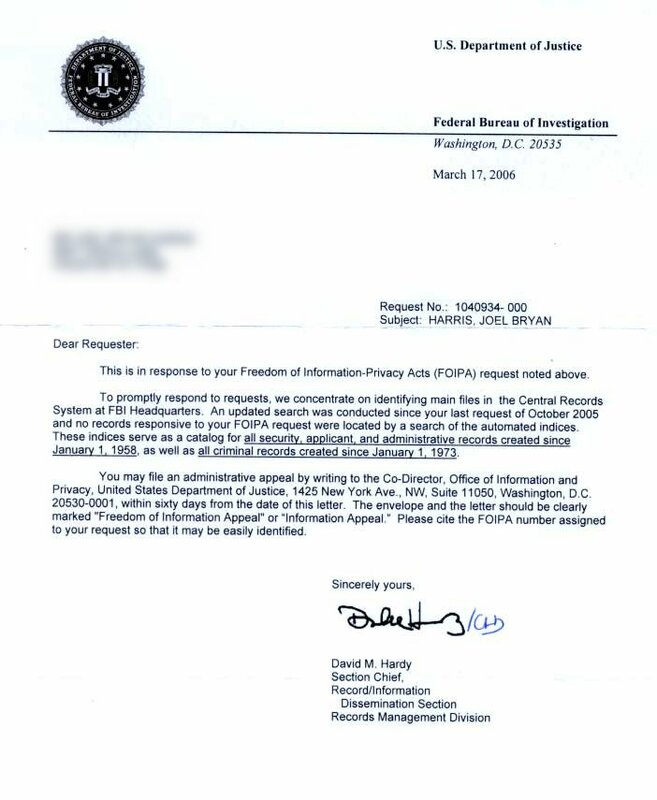 Here a date specification from the FBI becomes important as they would have received two different FOIA requests, one dated 9/12/2003 delivered from Houston Field office and another, dated 9/15/2003 faxed directly to Washington by the Plaintiff; the latter FOIA, dated 9/15/2003 being central as it contained the hand written note to "please disregard any FOIA requests received prior to or post this request." 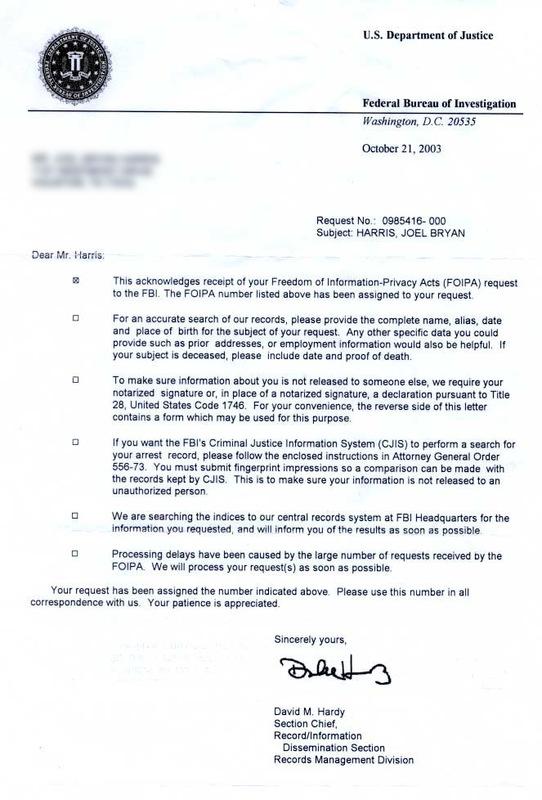 10/23/2003 - - Plaintiff receives word from David Hardy that no records responsive to FOIA request #0985416-00 were found; Plaintiff never is able to determine originating date ascribed to FOIA #0985416-000. 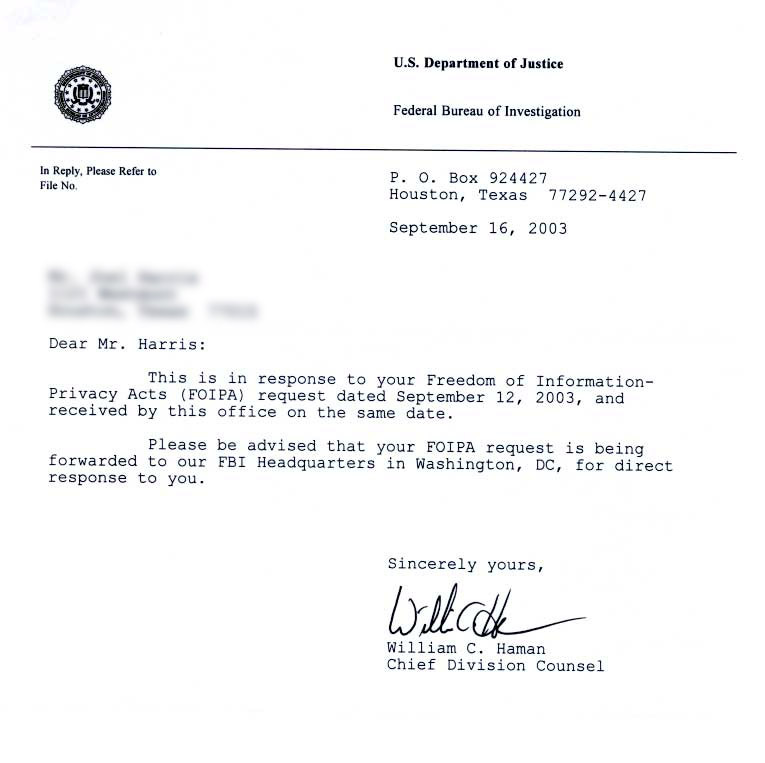 10/23/2004 - Plaintiff faxes new FOIA request to Washington FBI headquarters. 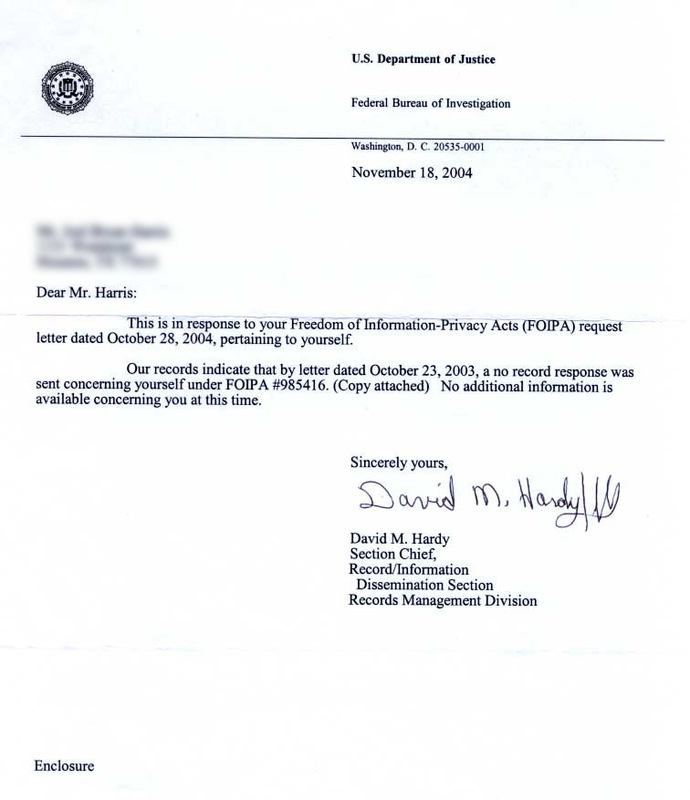 11/18/2004 - - Plaintiff receives reply from David Hardy re: the 10/23/2004 FOIA request; David Hardy reiterates the results from earlier FOIA #0985416-000 and claims there is no new information to convey. 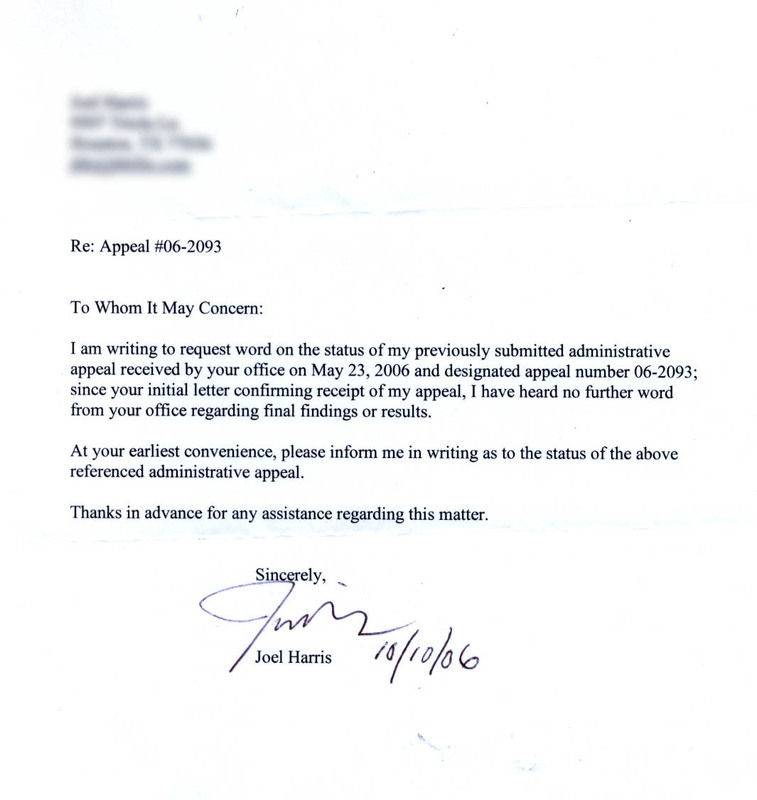 10/15/05 Approx - - Plaintiff receives reply from David Hardy that search request returns no records responsive; David Hardy fails to apply date to his response. 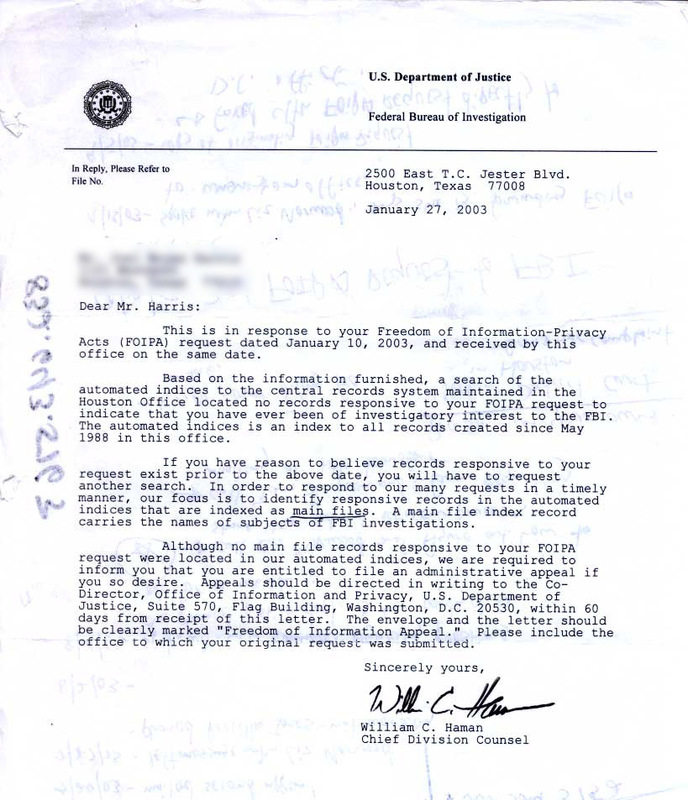 "To promptly respond to requests, we concentrate on identifying main files in the Central Records System at FBI Headquarters, ... "
This, legally, is an important bit of information because what is implied is that other files and/or investigation data may exist elsewhere, perhaps at any given national field office and simply had not been made a part of his very specifically mentioned 'Central Records System' at headquarters; Mr. Hardy even capitalizes the phrase, "Central Records System," to further isolate it and otherwise differentiate it from any of the other types of records systems which may exist such as regionally specific, field office records. FBI Headquarters is in Washington D.C., the very same office that I was forced to correspond with after just two visits with the Houston field office. See the funny story, below. My plan is to file an administrative appeal contesting the results of this search. 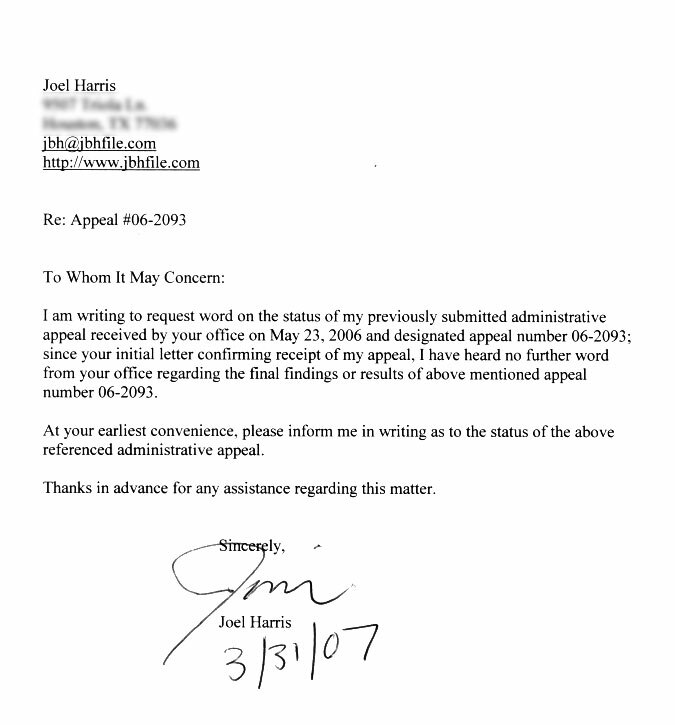 05/15/06 - - Plaintiff mails administrative appeal to Department of Justice, officially contesting the previous findings of FOIA # 1040934-00. 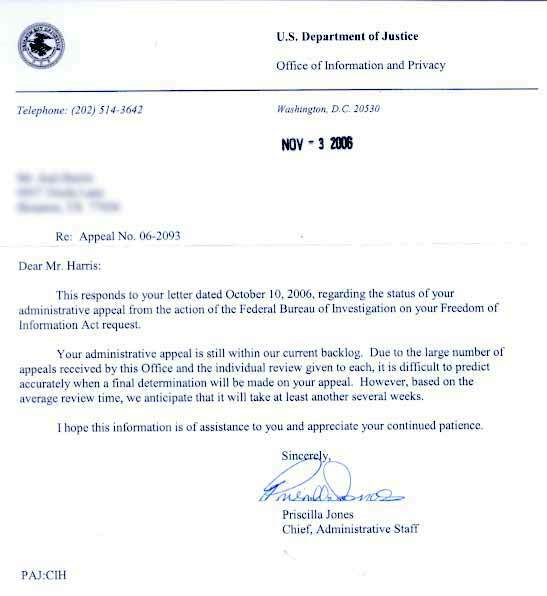 10/23/06 - - Having heard no further word from the DOJ regarding appeal #06-2093, plaintiff mails letter on 10/23/06 requesting the current status of said appeal. 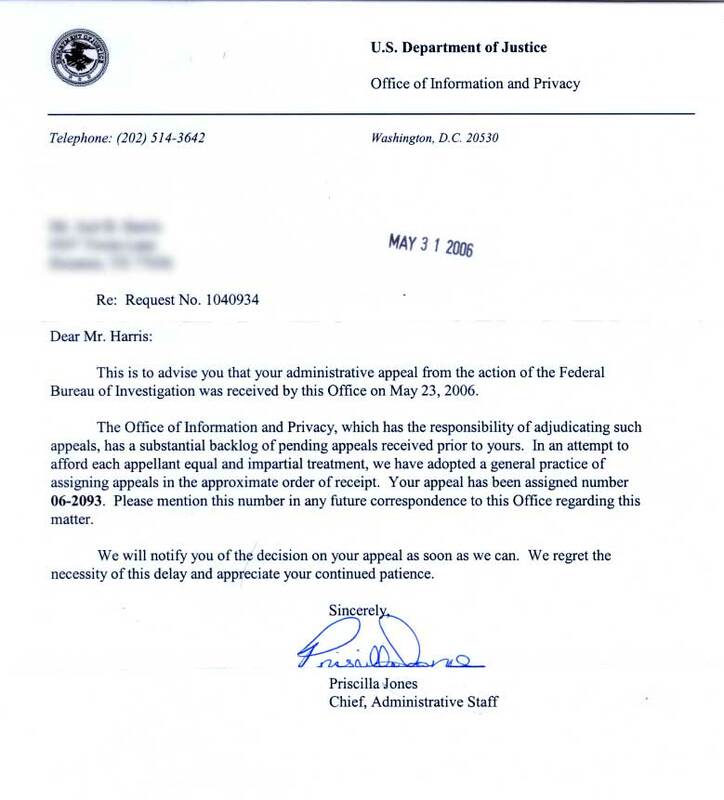 11/09/06 - - Plaintiff recieves word from DOJ regarding previously submitted (10/23/06) status request; official word is that appeal #06-2093 is still in que with other back-logged appeals and should be addressed within "another several weeks." 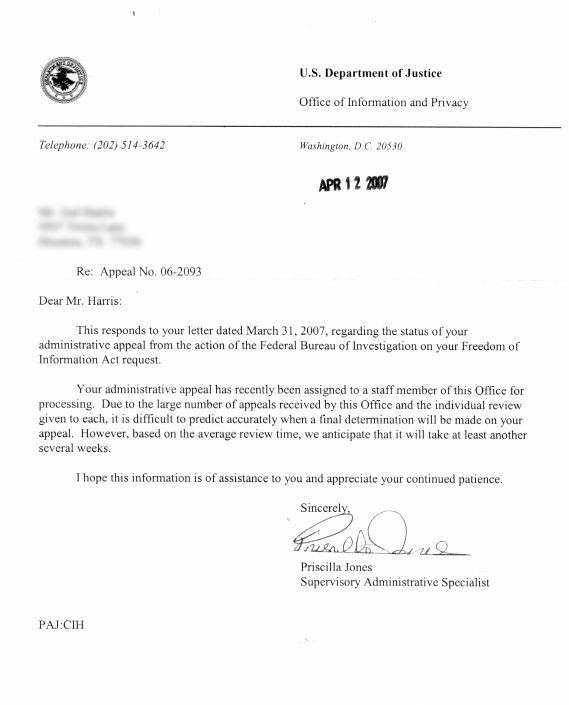 03/31/07 - - Plaintiff mails second status request to DOJ requesting the status of appeal #06-2093"
04/16/07 - - Plaintiff recieves word from DOJ that appeal #06-2093 is still in backlog and that final word on appeal should take "at least another several weeks". 06/26/07 - - Plaintiff recieves word from DOJ that appeal #06-2093 is officially closed, the DOJ having decided to confirm the original FOIPA findings. 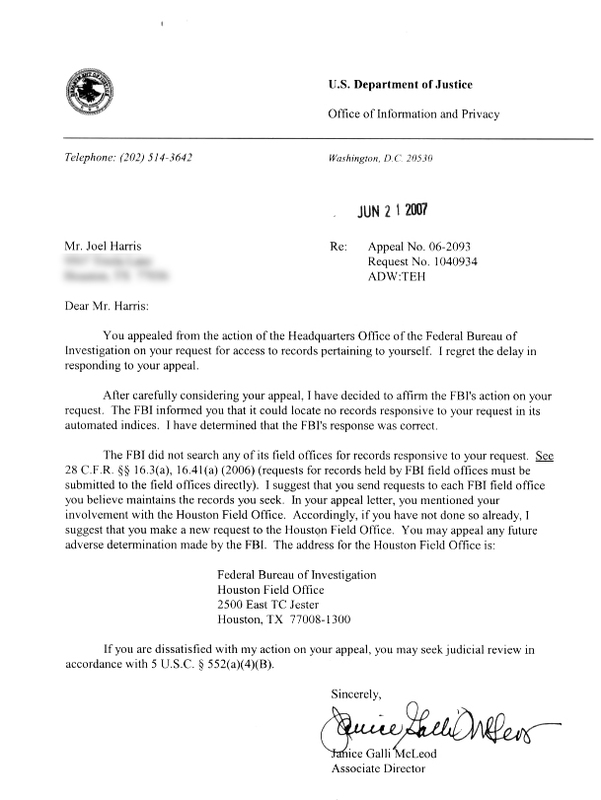 Something to note, however ... is that the DOJ contact did claim that, contrary to what the local Houston field office of the FBI informed me some years ago, that local field office records are not searched when submitting requests to FBI headquarters and that those records are generally located via FOIPA requests made directly to local field offices. This information is dramatically different than that given to me by one Elizabet Norwood of the Houston FBI so many months ago wherein she relayed to me that the Houston local FBI field office no longer accepted FOIPA requests. Interesting, eh? I'll post a full article related to this in the near future. 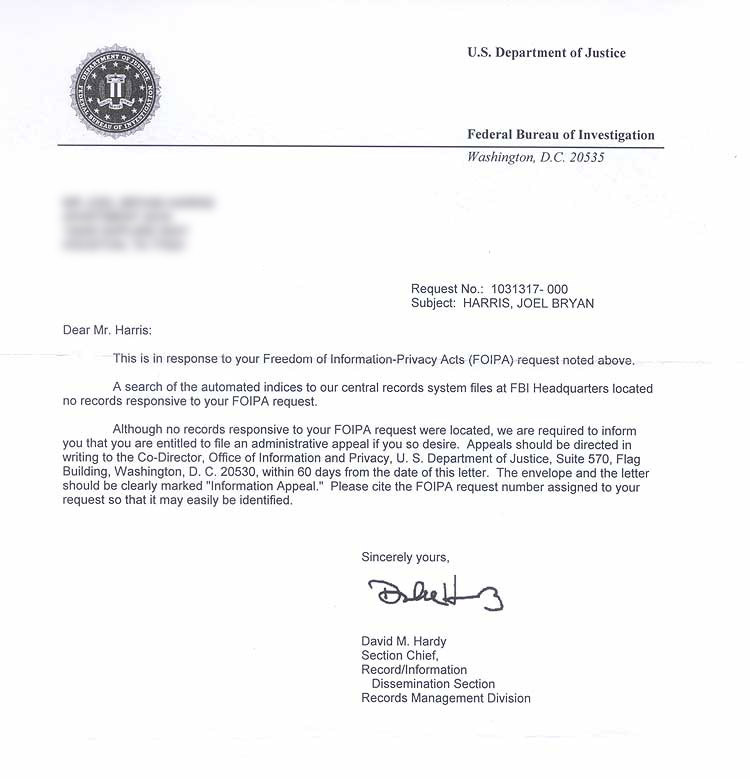 So far, each and all of my FOIPA requests have been met with 'null' responses, meaning no records were found in the FOIPA database or that the FBI is (very quietly) claiming one of the nine constitutional exemptions afforded them via the FOIPA act. Because it is a common practice for federal agencies to withhold data, claiming exemptions or otherwise, and because I know based on factual (unfortunately not legally provable) data that an investigation of me by that agency exists, I will continue with somewhat regular requests for the indeterminate future. 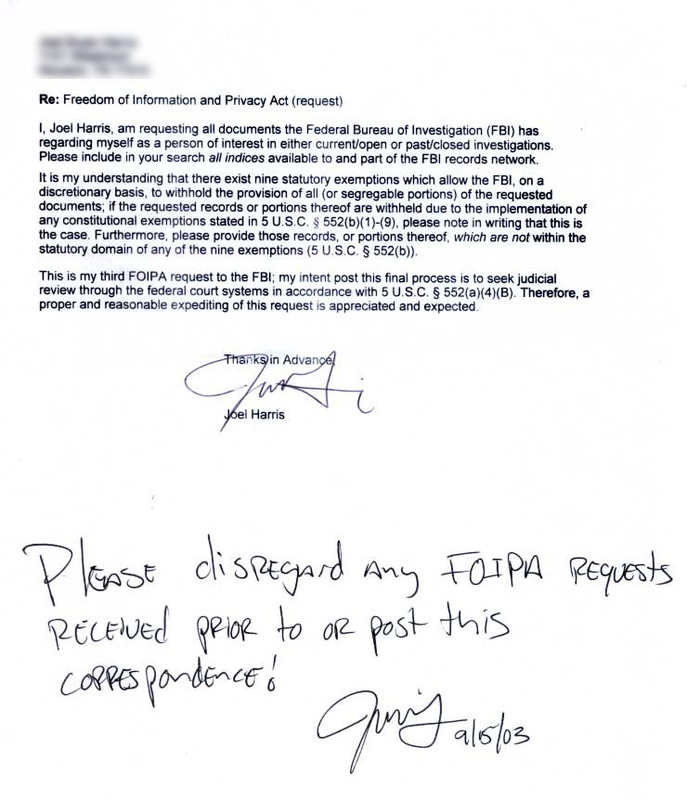 Again, it should be said that many persons have had to request data via regular FOIPA requests, for many years, every six months or every year, before ever receiving the data from the federal agency. From what I've discovered about my own personal circumstances however, that the agency wishes to bring a charge against me simply to legally justify their withholding of data, it is even more imperative that I make regular requests for the provision of the documents (and that I make my processes public!). For the indeterminate future, my plan is to make FOIPA requests at least once a year, and ideally, every six months, simply to keep the public awareness of continuity in my processes at the most effective level. At this point, my greatest defense against physical and emotional assaults, which have as an aim the limiting of my rights as a citizen, is to continuously and professionally, though certainly not fanatically, make the public aware of my circumstances. I will do this through this website and as well as ongoing and regular FOIPA requests. 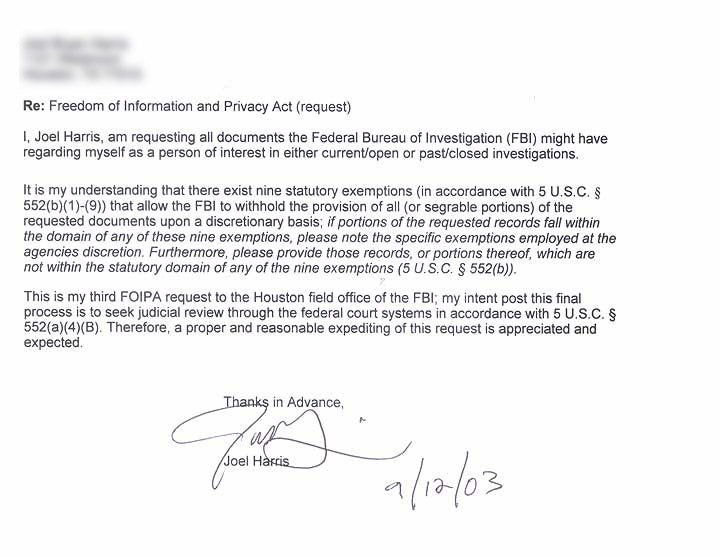 When I first began the process of making FOIPA requests, the Houston field office of the FBI, as was historically the case, was excepting all local FOIPA requests, in person, at the office. This was a boon to me. I didn't have to worry about possible delays due to the mailing system or any other sort of (possibly manufactured delay) on the FBI's end, in Washington. As you can see from the above timeline of FOIPA requests, my first and second FOIPA requests were made in person, with Elizabeth Norwood, at the Houston FBI field office. At the time of these first requests, I had already gained some confidence in my efforts because certain friends of mine had disclosed to me, in private, their awareness of the investigation, so I knew that when I was visiting the FBI office and meeting with Mrs. Norwood, I knew I was dealing directly with a person, and sometimes persons, who knew at an intimate level why I was there, and who also knew they had to, for whatever reasons, continue to cover up their involvement in the investigation; this was quite evident from the somewhat sweaty and very nervous mannerisms of those I met with on an occasional basis in the filing of my first FOIPA request and it's subsequent appeals. And the truth is, I relished each visit because in no way could I be put off and in no way could an excuse be offered for the supposed lengthening of the request process time. As illustrated above, in the FOIPA timeline, at the time of my second visit with Mrs. Norwood, she politely informed me that all FOIPA related matters associated with the Houston field office must now be handled via mail or fax with the FBI central offices in Washington. This meant that now I had to experience the understood delay that comes with corresponding via mail, and more importantly, I had no direct, face-to-face interaction with those responsible for the handling of the actual requests. Suffice it to say, my subsequent FOIPA requests were riddled with all sorts of complications, from lost FOIPA's to coy FBI representatives in Washington who made it nearly impossible for me to seek any type of direct, person to person, vocal status on any given FOIPA request I had filed or it's findings. 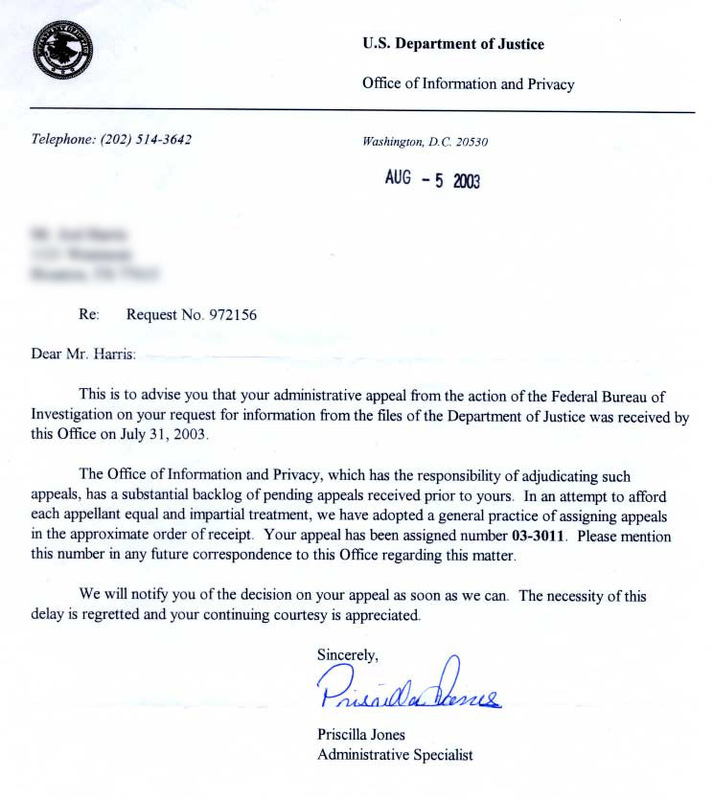 In essence, the FBI made it 1000% more difficult for me to make accurate and expeditious FOIPA requests, and effectively did away with any chance of seeing to the expediting of such requests on a personal basis. Coincidence? I don't know. Perhaps all the US FBI field offices suddenly, for whatever reason, decided to move such practices to a centralized location in Washington. Perhaps only the Houston field office changed protocol in such a way. My suspicion is the Houston FBI field office simply didn't like me visiting their offices on a regular basis; the very person they had worked so hard to apply a false public profile to, suddenly bringing the game, so to speak, to their front door. But, that's just my take on things.